(Newser) – Harriet Krzykowski felt abandoned—and terrified. A new counselor at Dade Correctional Institution's mental-health ward in 2010, the then-30-year-old heard about guards taunting and starving inmates, so she told her superior. That's when guards began abandoning Krzykowski in areas packed with potentially dangerous prisoners. "It scared the hell out of me," she tells the New Yorker. 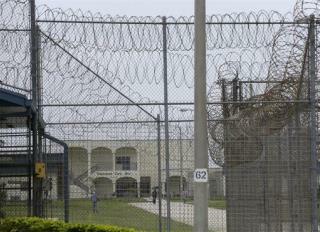 She realized how risky it was to complain about abuse at the Florida prison, where workers relied on guards for safety. So like most other counselors, Krzykowski said nothing when inmates were periodically tortured and beaten in the run-down, mildewed, cockroach-ridden facility. Then, in 2012, guards killed schizophrenic Darren Rainey by hosing him down with 180-degree water in a locked shower stall. Yeah, it's not the inmates that are scary ones, it's the guards. That's why i'm doing whatever i can to never get end up in 'pound me in the @ss prision'. Other inmate scares me............and the guard scares me. You can't retrain the guards (with a sadistic bent) to not be sadists. I hate to generalize, and hope I'm wrong, but doesn't it take a special kind of person to keep people in their cages?